I joined the railway in 1957 as a Lad Messenger (there were no vacancies for Telegraph Lads) at Grantham station. It was not a very auspicious beginning to what was to become a 47-year career. Reporting for duty on the morning of the Wednesday following the Easter bank holiday weekend, I was immediately called into the office of the Station Master (Mr Scampion) and ordered to explain why I had not reported for duty on the Tuesday following the bank holiday Monday, and why was I a day late? Luckily I had the letter instructing me to report for duty on the Wednesday in my pocket. My wage was 39 shillings per week, that's £1.95 in today's currency. My desk was situated in the admin room, next to the enquiry window. Access to the Station Master's Office (the inner sanctum) was gained through the admin office. The Admin Staff comprised of Chief Clerk, Roster Clerk, General Clerk, Typist and me. My duties included some paper work, taking enquires from the public and running messages throughout the station area and in the town. The Station Master’s presence, complete with bowler hat, was always expected on the platform when important trains, like the Pullman The Master Cutler, were due. 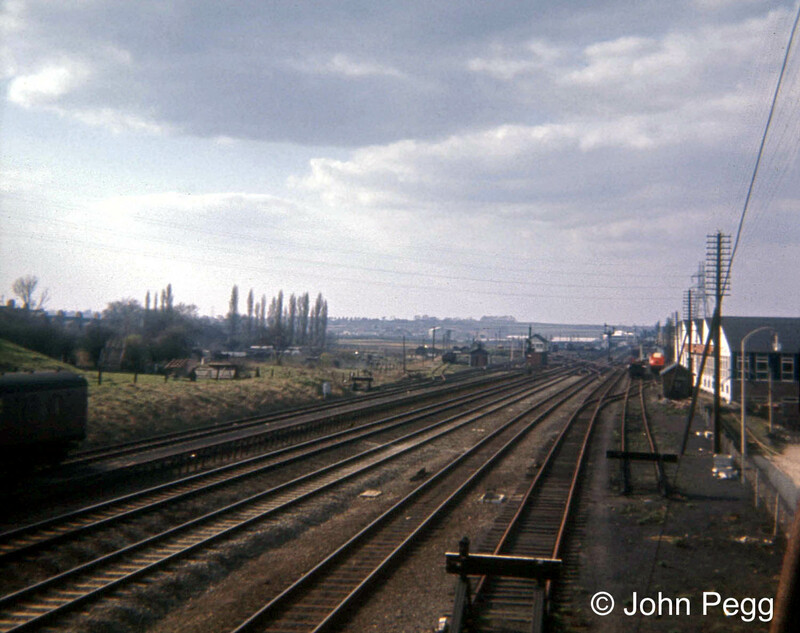 Grantham South signal box is prominent in this view dating from Saturday 20th July 1963. Passing on the Down Main line is Deltic No. D9004, as yet unnamed, with the 14:00 from London King's Cross to Edinburgh Waverley 'The Heart of Midlothian'. answering all telephone calls and reporting to Control as required. finally, the most important duty of all that had to be carried out on time and without fail was to provide the Signalman with his cup of tea. In addition to the regular Lads in the South and North boxes there were rest day and general purpose relief Lads who worked in both boxes. On a few occasions, when no relief was available, I worked some shifts at the North box. 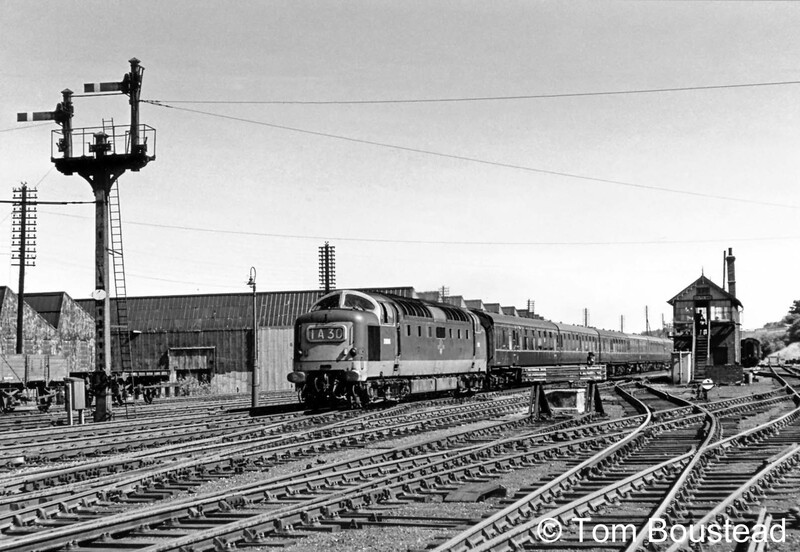 Steam had begun to be replaced by diesel locos and what a sight it was when the blue prototype Deltic began its trial runs, although its speed through Grantham platforms was restricted due to its width. The blue-liveried prototype Deltic is southbound in Spitalgate Cutting as it leaves the Grantham station area on Saturday 28th Febrary 1959. The train had passed Grantham South box just a few seconds before. The raised semaphore signal behind the third coach is the South Box Up Main line starting signal. A view from the Great North Road bridge looking north, taken between 1964 and 1968. Grantham South signal box can be seen in the middle distance. The tracks are, from left to right, two down refuge sidings, down main line, up main line, up goods line, up shunt line, siding; on the extreme right is a siding into the south end of the Ruston & Hornsby works and also the Aveling-Barford works. My first signalman’s post (1962) was at Barkston North. The box was situated adjacent to the Marston sewage farm. To set the scene I should explain why it was called a sewage farm and not a sewage works. 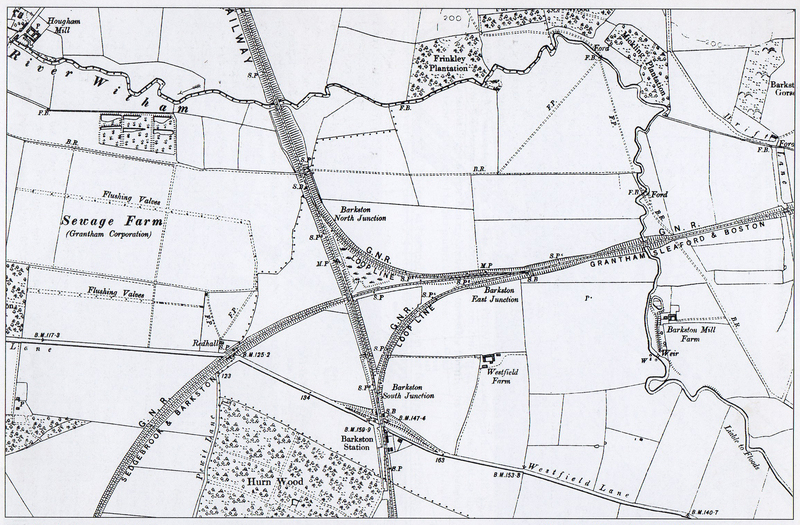 In those days the sewage (from Grantham) was allowed to flood onto the fields and was left to soak in. The nearest field so treated was adjacent to the box. Can you imagine what it was like in the summer? Phew! The box lighting was paraffin lamp, there was a coal fire for heating, and water was delivered, sometimes daily, in metal containers by the pickup (a train that stopped at all stations and signal boxes if required). It was best to boil it before drinking. Coal was also delivered in this way, although if we were running short it could be acquired from most trains that needed to stop at the box. There’s nothing like steam coal for keeping the fire burning bright. I remember once I had to caution a down train, and when I requested coal the obliging fireman tipped an enormous lump off the tender, remarking "It's too big for me to break - you have a go!" Barkston North Junction box controlled junction points round to Barkston East Junction and also into the up main line loop; Barkston South Junction controlled the exit. That’s the loop, by the way, where Mallard started its record run; a bit before my time though! Over previous years the ground between the north curve and the Allington line had been used as a dumping ground for ashes. Some, no doubt, were still hot when deposited and for many years the whole area could be seen smoking. Occasionally bushes and small trees would burst into flames and on the night shift it could be quite a spectacle. Sometimes trains would have to be cautioned due to the smoke; it also prevented me from using the up loop until the fire was extinguished. A few years after I left Barkston North a concerted effort by dumping water on the site was successful in extinguishing the fire permanently. 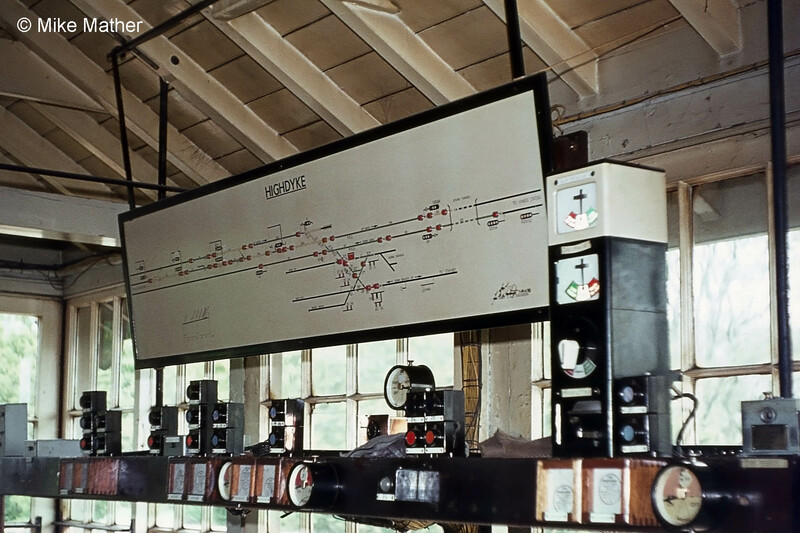 Here is a link to a photograph which shows Barkston North Junction signal box in about 1949. Hougham was my second box. Unfortunately the station had closed, but the goods shed was still open for the pickup to attach and detach, as the clip below from The Lincolnshire Film Archive shows. The down loop was used regularly by slower freight trains; we had regular heavy brick trains from Fletton heading north which often had to detach wagons with hot axle boxes. About two miles to the north of Hougham was Westborough box, a small ground level box which had crossing gates for a minor road which is now just a bridle way. To the south was 142 farm crossing, manned by a crossing keeper who had to request permission to open the gates from Hougham box. Hougham box closed on the weekend of April 29/30th 1972, the same time as Barkston North and South Junctions. Here is a link to a photograph which shows Hougham signal box in 1959 …and here in 1969. In the mid-1960s I was at Honington box, which worked to Barkston East in the west, to Ancaster in the east on the Sleaford line and to Caythorpe and Leadenham on the Lincoln branch - until the infamous Dr Beeching closed the line. A gate wheel was used to close the gates over the busy A607 Lincoln road. When I transferred here it gave me the chance to start using the telegraph regularly again. 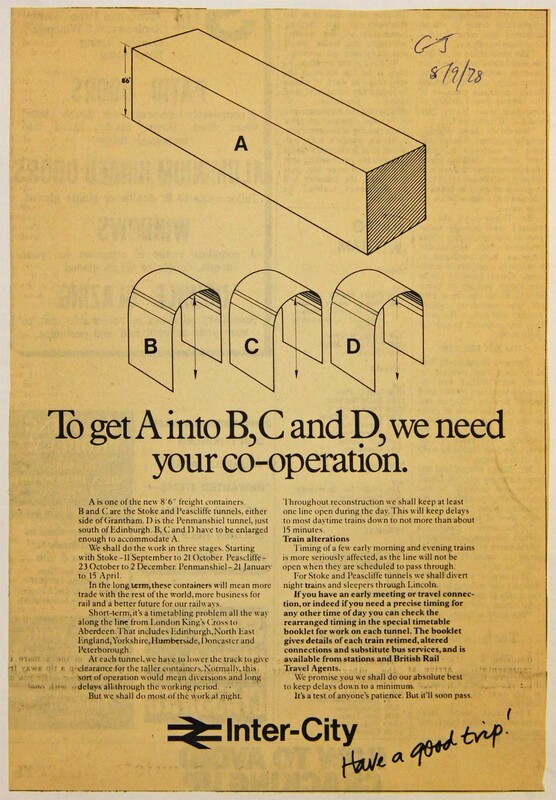 I didn’t use it much at Barkston North and Hougham, but at Honington there was a distinct shortage of telephones. One was to the boxes on either side and to the crossing keepers at Frinkley Lane and Hough Lane crossings (who had to request permission to open their gates from the box); the only other telephone was to Control. All administration for the box and the crossings was via the telegraph. We also received, from time to time, messages for the RAF depot situated adjacent to the station goods yard. On occasion the royal train was stabled overnight at both Honington and Leadenham. One incident that comes to mind happened one really foggy morning about 8am. After receiving ‘train entering section’ from Ancaster for a class F freight train I closed the crossing gates and cleared my signals for the train to proceed. A few minutes later there was an almighty bang, and upon investigation I observed that a car had crashed through the up side gate and had come to rest on the crossing, with the gates closed behind it. After placing the signals to danger and sending the appropriate bell signals to Ancaster and Barkston East I left the box, collecting the three emergency detonators on the way out (they were always hung near the door). Once on the track I saw that the car driver had got out of his car and I shouted to him to get off the track, before setting off at a gallop in the thick fog towards the approaching train. Eventually I laid the detonators and stopped the train. When I returning to the box I was greeted with “What did you run off like that for? I thought my accident had frightened you.” Then, after asking the driver how he had managed to crash through the gates he replied, “Going too fast, couldn’t stop, didn’t expect the gates to be shut. I’ve been going to Lincoln at this time of day for the last two years and have never seen a train here at this time.” The careless treatment of rail crossings hasn't changed much - it's still the same in 2014. Honington Box closed on 29th July 1984. In the 1970s I was back on the east coast main line, this time south of Grantham at Highdyke box. Working to Great Ponton on the north side and Stoke box to the south, with Colsterworth on the branch line for the ironstone mines. Highdyke box had a very heavy frame. Setting the road from the up slow over the up and down main lines to the branch line was particularly hard, especially in the cold weather of winter. Unlike the other boxes, where I had led a solitary existence, there were other staff about: Yard Inspector, Shunter, Examiner and various train crews. By this time, of course, the era of the steam engine has passed and all we see are diesels. Two class 31s are the pilots for bringing down the iron ore from Colsterworth, Stainby and Sproxton for marshalling in Highdyke yard. The engines were fitted with single line token catchers to enable them to drop off and pick up tokens at Colsterworth without stopping, due to the gradients. 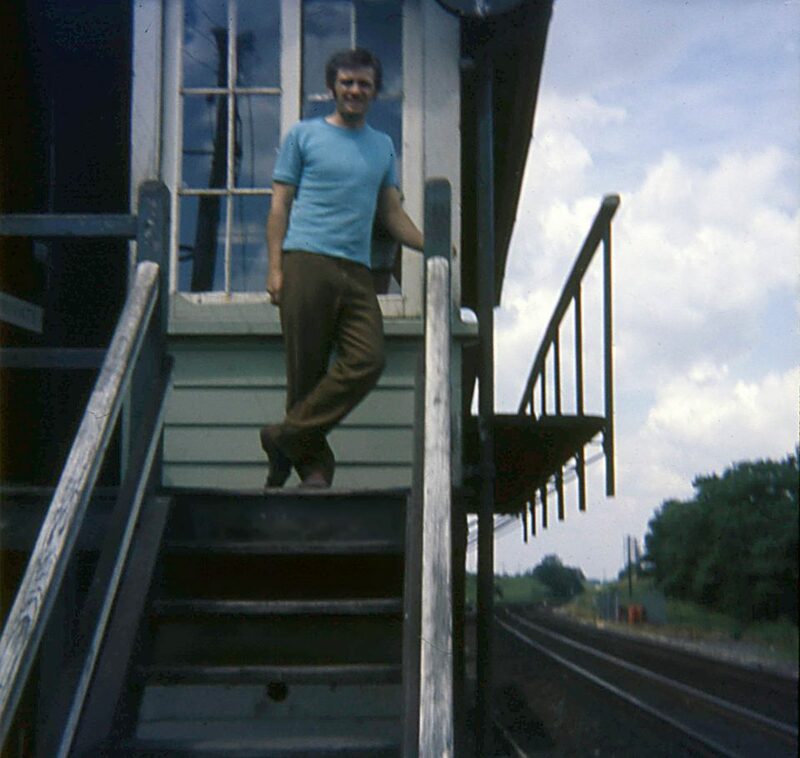 Signalman John Pegg on the steps of High Dyke box in 1974. Photograph lent by John Pegg. 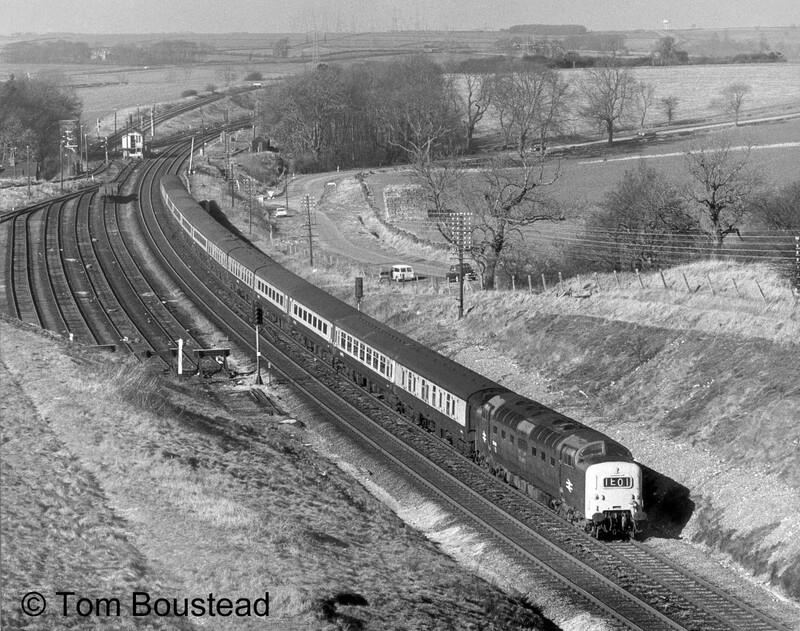 A sunny day on the east coast main line in 1974 at High Dyke, looking north. The approaching train is on the up main line. To its right a freight train has arrived on the up goods line from Grantham. It will wait until the High Dyke signalman allows it to join the main line for the two-track section through Stoke tunnel, which is entered about a quarter of a mile behind the photographer. The ironstone branch to Stainby and Sproxton had closed when this photograph was taken, though the connection appears still to be in place beyond the box. 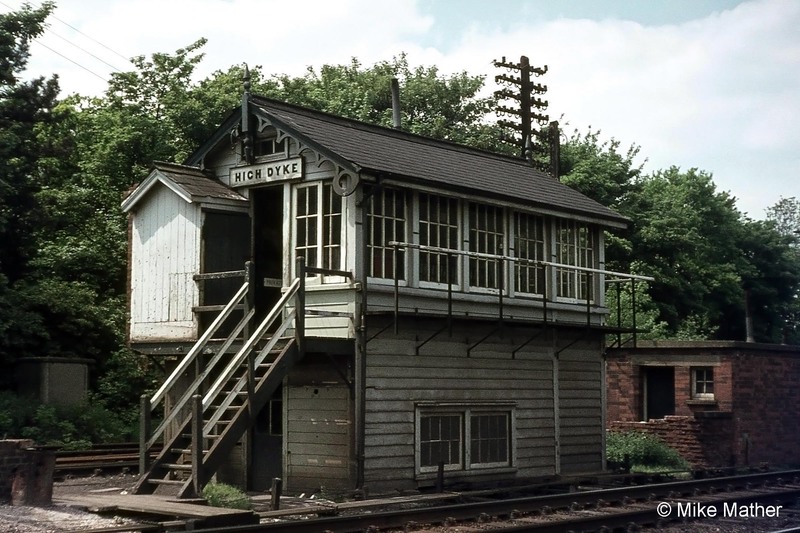 High Dyke signal box in June 1974. 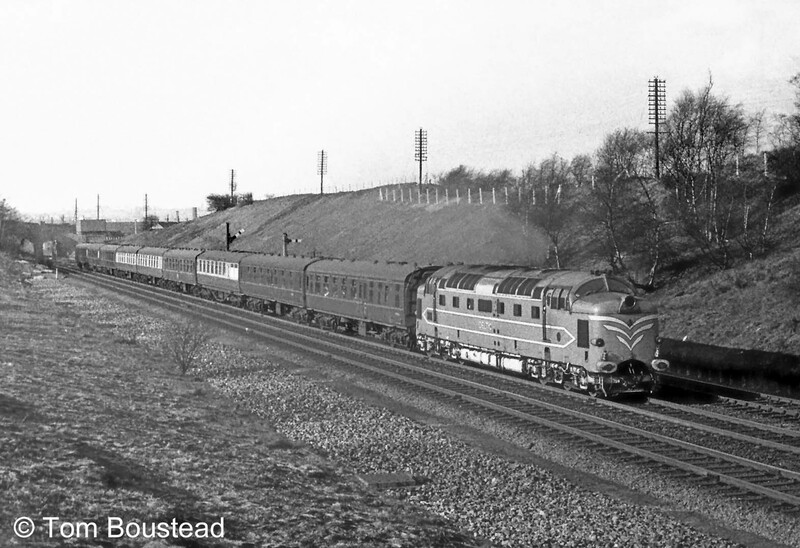 At this time there were no regular trains on the High Dyke branch because ironstone mining had ceased in August 1973. However, the infrastructure remained intact until October 1974 to provide access to the Market Overton site of Flying Scotsman Enterprises. 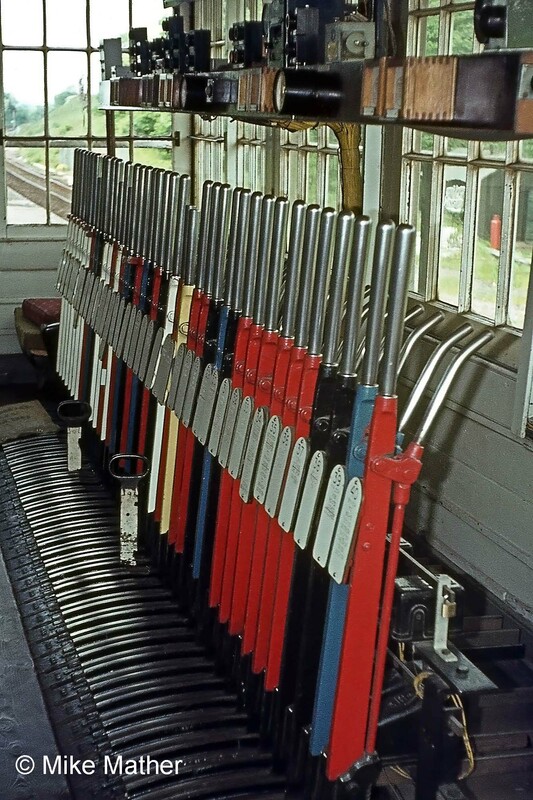 High Dyke signal box lever frame, June 1974. 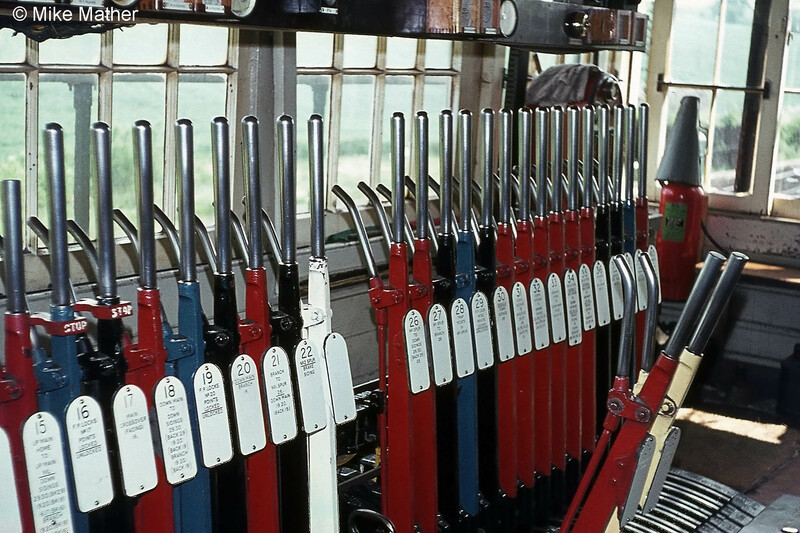 Another view of the lever frame at High Dyke in June 1974. High Dyke signal box block shelf and diagram, June 1974. The Tyers Electric Key Token instrument at High Dyke. This instrument allowed a key token to be issued to the driver of a train which was to travel on the branch. This key token was the driver's authority to use the single line to Colsterworth. 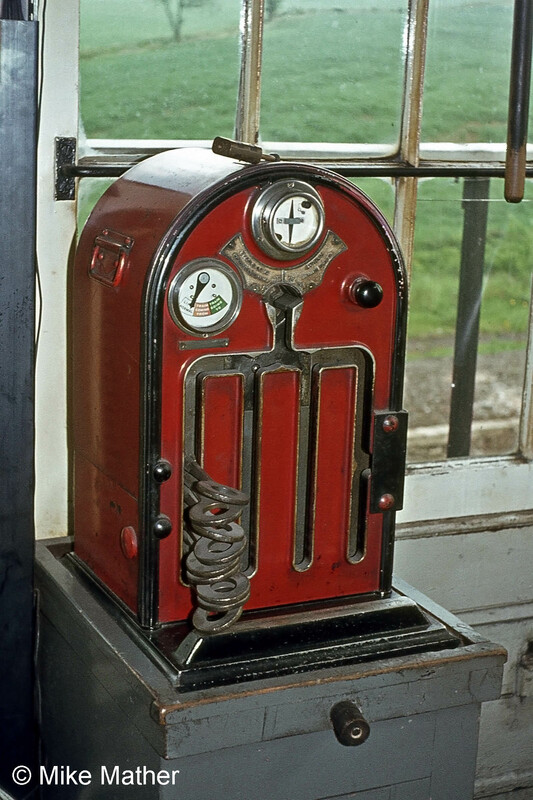 There was an identical instrument at Colsterworth signal box. The two instruments were electrically connected so that only one key token could be removed at a time from the pair of instruments. Once a key token had been withdrawn from either instrument both instruments become locked until the token was replaced in one of them. Thus a driver who had posession of a token knew that no other train could be authorised to travel over the section. During my period at Highdyke in 1972 I did see another steam engine. Pendennis Castle was booked to travel up the branch to Stainby and then onto the private railway to Market Overton. Unfortunately when it arrived at Highdyke, adjacent to the signal box, it was short of water. “So now what do we do, chaps?” Well, we can attach a hosepipe to the tap in the Shunters’ cabin, and let’s ask the Signalman if he’s got a few buckets that we can fill from the box tap, and then we will form a chain down the box steps and pass them from man to man. We just need a volunteer to pass the buckets up to whoever is on the tender. What, no volunteer? Looks like the supervisor travelling with the loco will have to do it. I can’t remember who he was, but he turned out to be very long suffering. Well, after a couple of hours and dozens of buckets of water, a flooded signal box floor and the supervisor wet through to the skin, Pendennis Castle was using more water ticking over than was being put in the tender. The task had beaten us and the loco was retired to a siding to fight another day. Highdyke box closed on 24th October 1977. Here is a link to a photograph of No. 4079 Pendennis Castle standing next to High Dyke signal box. In the mid-1970s I was at Grantham Panel (Grantham signal box, located in the building of the former Yard Box) working with Claypole to the north, Peterborough to the south, Allington Junction on the Nottingham branch, and Barkston East on the Sleaford branch. The Signalman had a Railman to answer the telephone (though not signal or point phones), report trains to Control and keep the train register up to date (no, not a Telegraph Lad). There were no heavy levers to pull in this box, just switches to turn, but the area of responsibility was much larger. 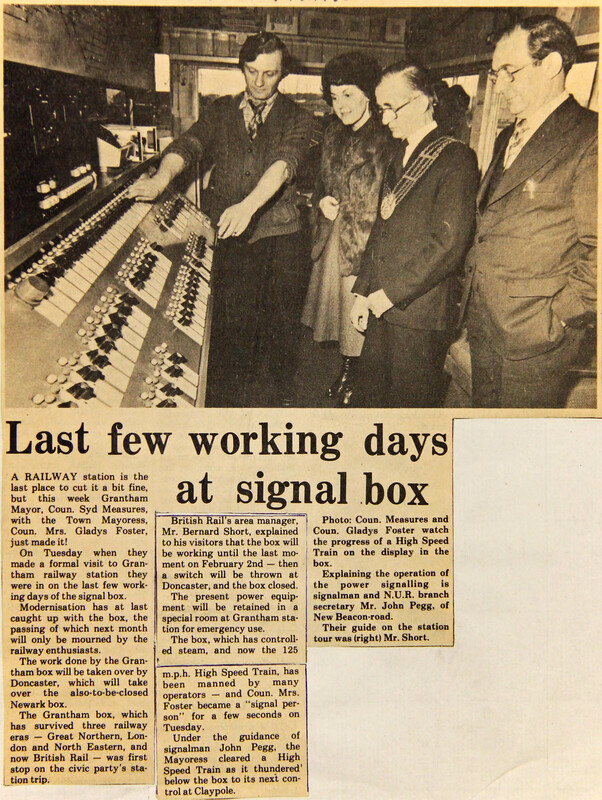 Early in 1980 the Mayor of Grantham made a formal visit to the station where John was on duty in the panel signal box. We still had a Yard Foreman and a Shunter working with a pilot engine, organising various wagons throughout the up and down side yards. A siding was laid to give access to Read’s factory on Springfield Road. The factory manufactured cans and twice a week wagons of tin plate would arrive from Wales, having come via Peterborough. The up/down goods line was extended at its south end to accommodate empty oil trains from Colwick; the engines needed to change ends before proceeding northward on the East Coast Main Line. In 1978 to carry out track work, first in Stoke tunnel and then in Peascliffe tunnel, temporary single line working without a pilotman was implemented for about three months. The track work was to facilitate the passage of Freightliner trains carrying the larger continental containers - see the press announcements below. Grantham panel box closed in May 1980. Two of the affected tunnels were either side of Grantham, at Stoke and Peascliffe, and thus under the control of Grantham signal box. John Pegg and his colleagues at the box managed temporary single line running arrangements without a pilotman during the daytime, when the tunnels were open for traffic. The enlargement works at Stoke and Peascliffe tunnels were completed on schedule by December 1978 as announced here in The Grantham Journal. Nice write up, John. My Dad worked at Stuarts and Lloyd's (based at Sewstern) ironstone works in the 1960s. I always wondered where those wagons full of iron ore were going. Great pictures by the way. Hello John, sorry for the delay in replying but i have been away. Your photo of the station cat monument reminds me of our numerous Christmas day lunches being delayed whilst my brother Derrick went to open up the station to give the cat its special celebratory feast. Thinking back the cat always got the first slice off our turkey along with other tasty Christmas morsels. The photo of the best station award is interesting, I've not seen it before, that's Derrick crouching in the front. I was a Guard at Grantham from January 1970 until April 1972 before I transferred to Newcastle as a Passenger Guard. What I was wondering was your brother Derrick a signalman at Colsterworth? Really enjoyed reading about your signalling career. hi Neil, glad you found my memories interesting, no Derrick was not a signalman at Colsterworth but he was on the same branch line at Stainby as a shunter until the branch closed. He then transferred to a guards position before finishing his career on the railway at Grantham station. Hi John. Thanks for that info. I knew the name but I got his grade wrong. I worked Great Ponton signalbox from 1969 till just before it closed, I then moved to Allington Junction till I left Nov 1975. I started as a telegraph lad at North Box. My signalman being Bernard Knipe, but I did 12 hour shifts most of the time so was with all three signalman including the relief signalman. I must have worked next to you sometimes as you were in High Dyke and Yard box with the panel. Were you on duty when the guard Frank Mapletoft fell from the Nottingham train and was killed? I was on duty that Saturday morning at Allington Junction. I have done many and various things since leaving the railway... but the railway never leaves you! Hi Ian, great to hear from you, yes you're right the railway never leaves one and even though there have been so many changes it's still great to get a reminder of the old days by finding a vantage point at the line side to watch the various steam specials streak by, oh yes the streaks were the best and still are. No I don't remember being on duty when the accident occurred but we could well have worked to one another during your time in the signal boxes. I wondered if you remember my Dad, Robert (Jock) Moir, he was in the S&T department as an assistant technician. He worked with Eddy Lee and others. It was my Dad who got me the job on British Rail. “One morning with Bob Moir and 3 or 4 others I went to Bingham station to work on a signal outside, and shortly after we got there it started to rain. By dinner time we were all soaked and had a choice to go to the cabin for a cup of tea and dry off, but we decided to carry on until the job was finished then went to the cabin for dinner. Whilst we were drying off one of the lads put the radio on 'to cheer us up'. This turned out to be Two-way Family Favourites and a family requested a record - Jane Morgan singing The Day that the Rains Came. Jock said "That's all we need!" I don't want to be pedantic but the Guard who fell from the train was called Frank Mapletoft not George. Note: we have corrected Frank Mapletoft's name in the comment referred to by Neil. The accident occurred in the spring of 1972. Very Interesting to discover this site. I started on the Railway as a Telegraph Lad at Grantham South in 1965, travelling to the Signalling School at Retford via Leadenham (08.07 from Up Bay at Grantham) returning late afternoon main line. Signalmen at Grantham South: Bill Munton, Graham Colbourne, Tom Hogan, Sam Richard, George Buckley, Stan Richardson. All the experience gained helped me get a Signalman's position at Great Ponton in 1968. I closed this Box in February 1972, then transferred to Ancaster (not busy enough after the Main Line), 1973 to Corby Glen. In 1975 I started at Peterborough on the Footplate. Passed as Driver in 1982 until 2016, when given 6 months' notice. I've always been keen to ensure that on Tracks through Grantham Signalmen, and signalling in general, receive the profile they deserve. So thanks very much for getting in touch, not only with an outline of your signalling career but also for noting the names of the signalmen with whom you worked at Grantham South. I've had some pages about Grantham South box in preparation for quite a while, and one of these days I'll get round to finishing them. Regarding a car going through the crossing gates I remember very well a similar experience at Honington Junction. It must have been late 1968 when one foggy morning just after 8am while I was waiting near the crossing gates for the bus into Grantham for school an Austin Cambridge smashed through the gates and was stranded on the tracks. My father, George Grantham who was signalman at the time dashed up the tracks and laid detonators to stop the train - I believe he received some sort of award from British Rail for averting what could have been a nasty accident. I still have press cuttings from the Grantham Journal detailing this. Later in the day, during our school music lesson ( I was 13 at the time ), I related the details to the boy sat next to me and he said 'That sounds like my father’s car, he goes that way to work about that time.' Sure enough, the next day he confirmed it was indeed his father and, a little while later, his father was fined £25 for dangerous driving. Thank you for this story - another motorist driving in haste, no doubt with their mind on things other than the road ahead. On the contrary, the vigilance and speedy response of a signalman - in this case your father - frequently 'saves the day' on the railway. Despite there being fewer of them today and not, in may cases, 'on site', one only has to read a few recent accident reports to see that very often a signaller's intervention remains critical to the safety of the system. Hi Neil, it's interesting to hear from you regarding George's similar experience. I was lucky that the freight train driver saw the up distant signal go back and so slowed his train accordingly. Over the years, whilst working at Honington, all of us had numerous incidents concerning the gates, mostly just glancing blows that did more damage to the vehicle involved than the gate. So George got an award - good for him. All I got was a request for an extract from the train register.